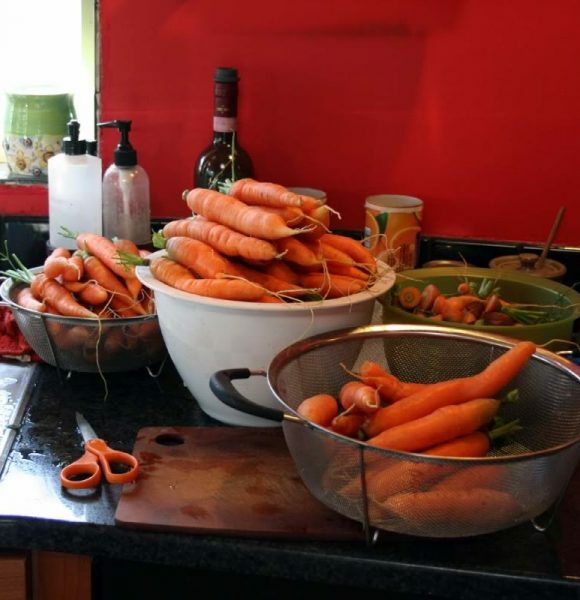 It was a banner year for carrots on the Farm. I can’t remember a harvest that brought so many in. That means I had plenty to freeze and a surplus to make a lovely soup for the hubby to enjoy on nights I don’t feel well. It’s a recipe for carrot soup I’ve been working on and I think I’ve finally perfected it. The garden is doing well as I showed you in the latest state of the garden post. 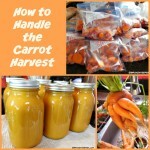 The hubby brought in the carrots and I went about processing them for winter’s eating. The first thing I do when they come in is trim off the tops (the goats get the bulk of the greens but I do freeze some for using in soups and stews later in the year) and wash them. Then I separate them into piles; eating, too big and WTH. WTH are the carrots that are all twisty and bizarre. These and the too big carrots I save for soup making or pickling. This year the hubby asked for more soup so I didn’t pickle any. For freezing I clean and trim the carrots and cut them into coins. Then I set a pot on to boil so I can blanch them. I have the sink full of cold water waiting so I can quickly cool them down. 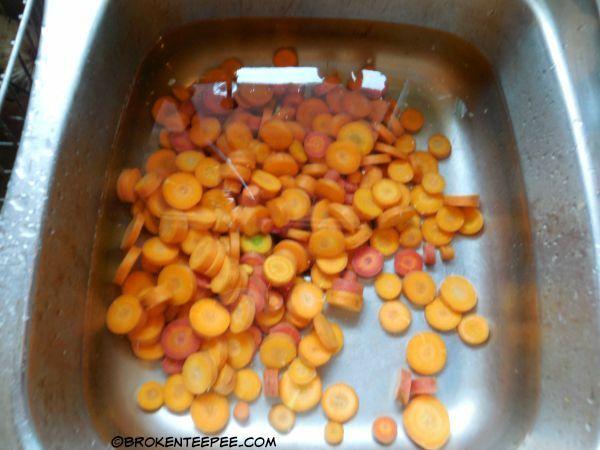 Once the water hits boiling I drop some of the carrots in and then scoop them out. Then they go into the cold water in the sink. 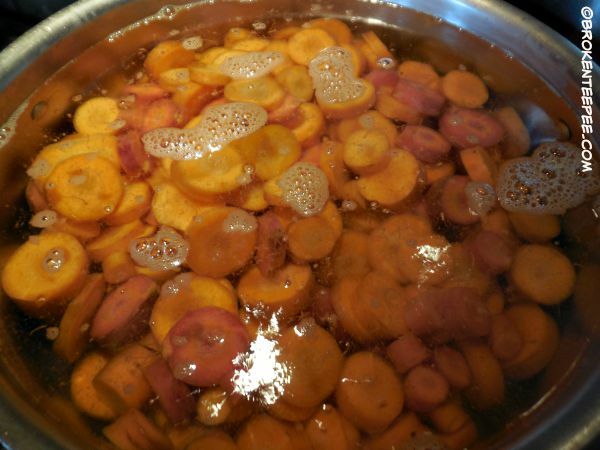 I wait for the pot of water to hit boiling again and repeat the process until all of the carrots are blanched. Then I put them in zip bags for freezing. 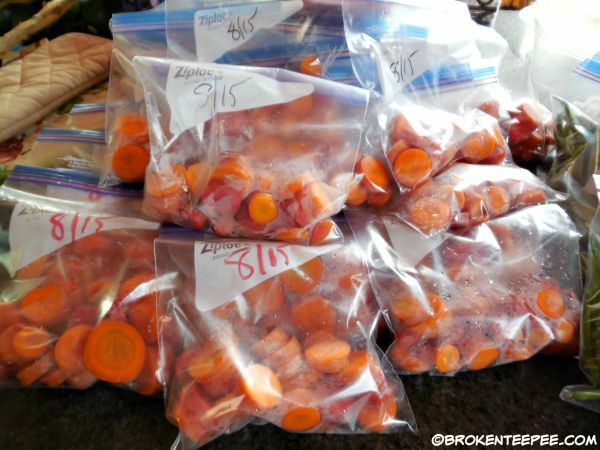 I don’t like carrots so I parcel them out in one person servings. Some of them will get used for soups and stews. I always date my produce because I usually have multiple years of each type of vegetable in the freezers. The rest of the carrots went into the soup. 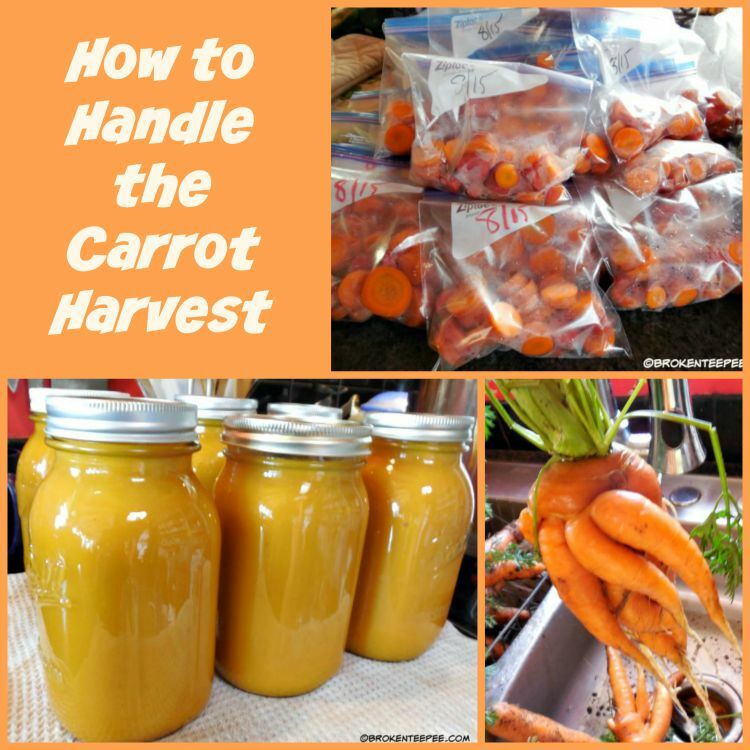 It’s something I came up with a couple of years ago when we had a massive carrot harvest and the hubby really fell in love with it so I’ve been making it every year now. 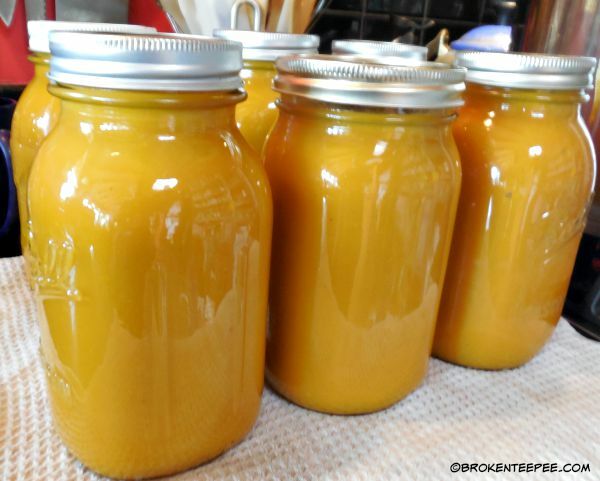 What I am canning is really a base because when I open a jar I add milk to it so it becomes a cream of carrot soup. 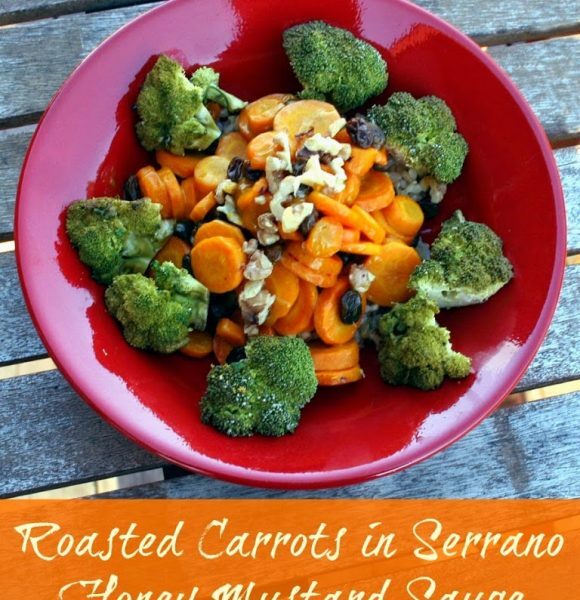 It makes for an easy meal in the winter for those nights that I am not feeling well. The amount of soup I get is totally determined by how many carrots I have to work with – this year it happened to be 12 pounds. Other years I have had less. 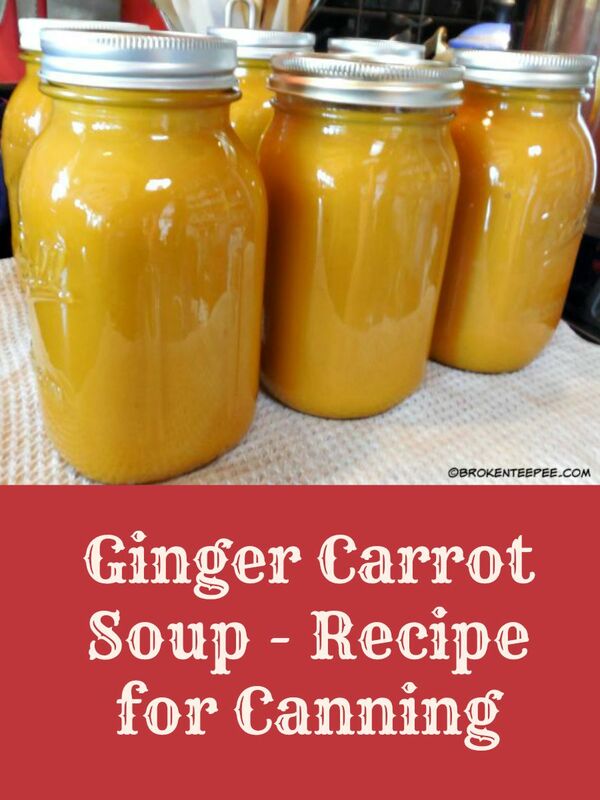 This year’s harvest gave me 9 quarts of soup so I have presented the recipe for what I had this year. I am also still developing this recipe and it is still evolving from the first year I made it. Heat olive oil in a very large (mine is 22 quarts) heavy bottomed stock pot. 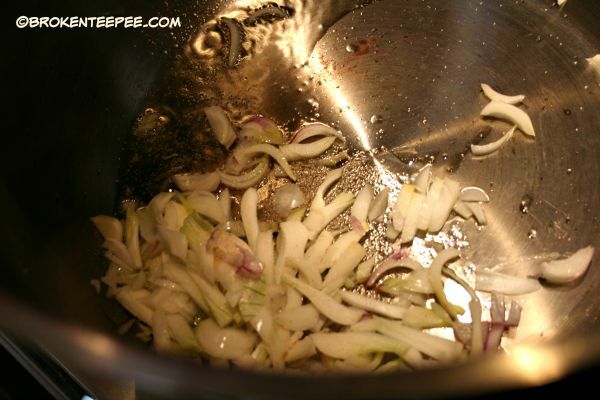 Add the onions and saute until they are soft and just starting to turn brown. 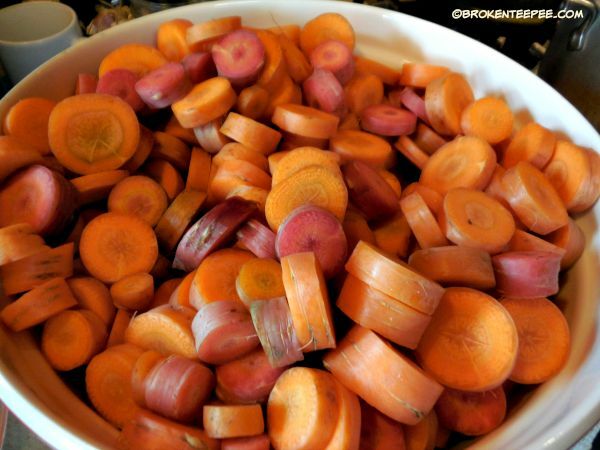 Cut the carrots into chunks and add them to the pot. Just cover with water. 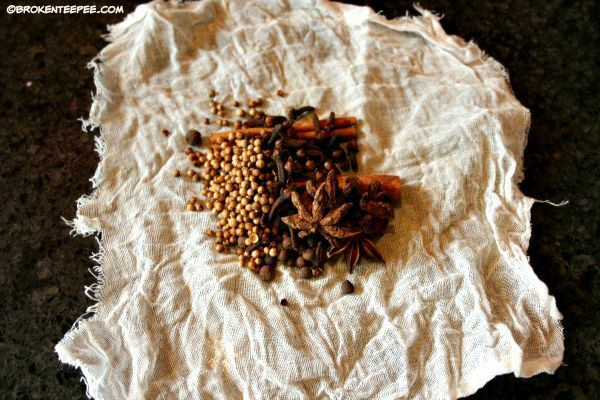 Add the spices to a bit of cheesecloth, tie and add to the pot. 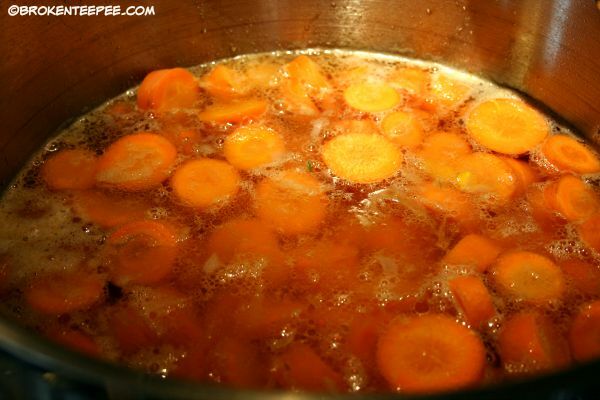 Bring to a boil, lower the heat and let simmer until the carrots are basically mush. If you need to add water to keep them just covered do so. If you need to let the pot sit over night it is OK. 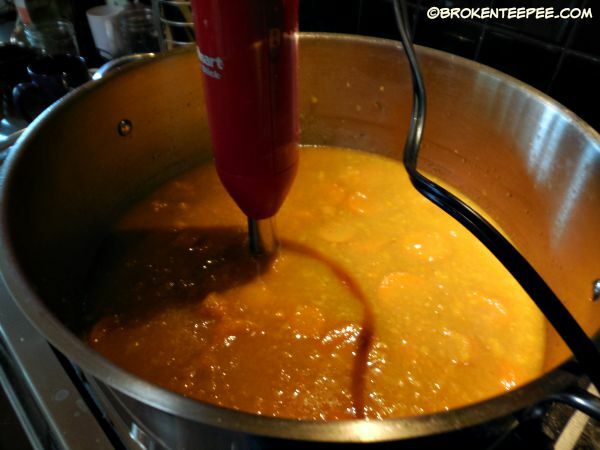 When the carrots are very, very soft remove the spice bag then use an immersion blender to reduce the mixture to a smooth soup. If you don’t have an immersion blender you will need to move it bit by bit to a blender and return it to the pot. I highly recommend an immersion blender. 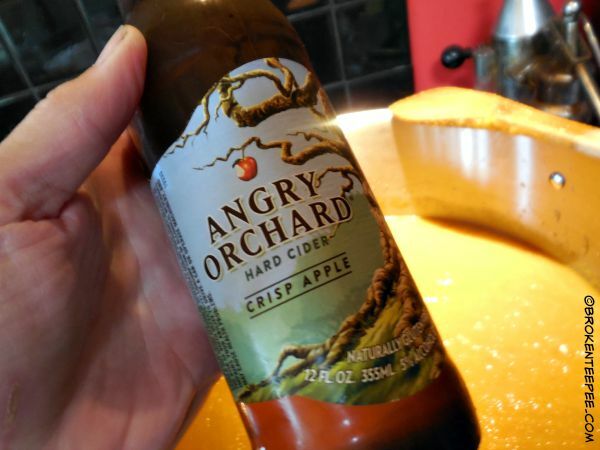 Add the beers/hard cider and bring the soup to a simmer. Taste and adjust seasoning with salt and add tabasco to preferred heat. Be aware the soup will cook down a little further. 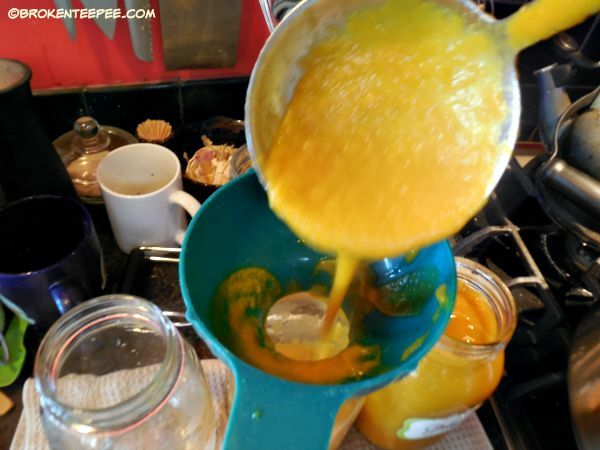 While the soup is simmering prepare jars and pressure canner. 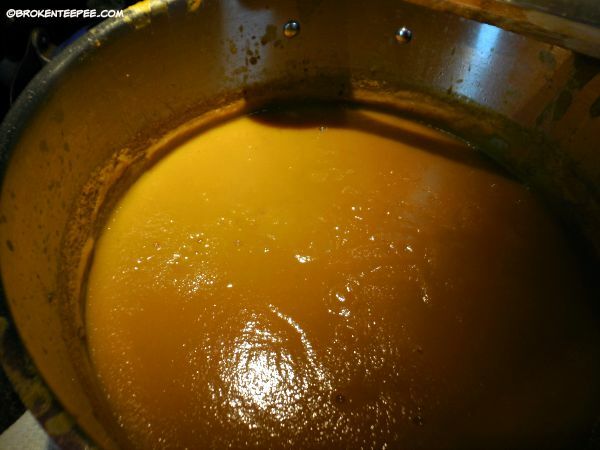 Add the hot soup to clean jars leaving 1/2″ headspace. 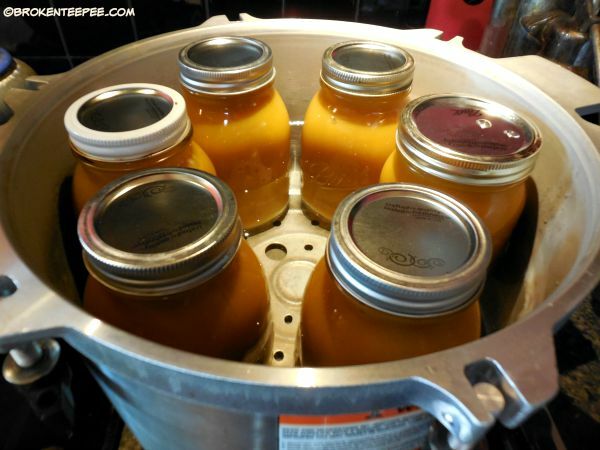 Follow the instructions for your canner. I am at 3000 feet and I can this soup at 15lbs for 45 minutes. To serve: I open a jar and add about a pint of milk. I heat it through and then put a dollop of plain yogurt in the center, sprinkle some toasted pumpkin seeds and some cinnamon. The hubby really enjoys this soup. He tends to like it a bit on the hot side – between the ginger and the tabasco he is a happy man. 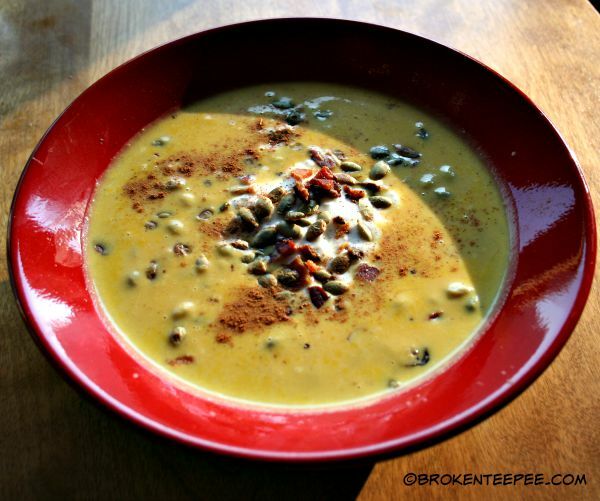 The yogurt adds a cooling touch of creaminess and the pumpkin seeds add an earthy crunch. He ate two bowls on the night I canned the soup. I do love when enjoys what I cook! 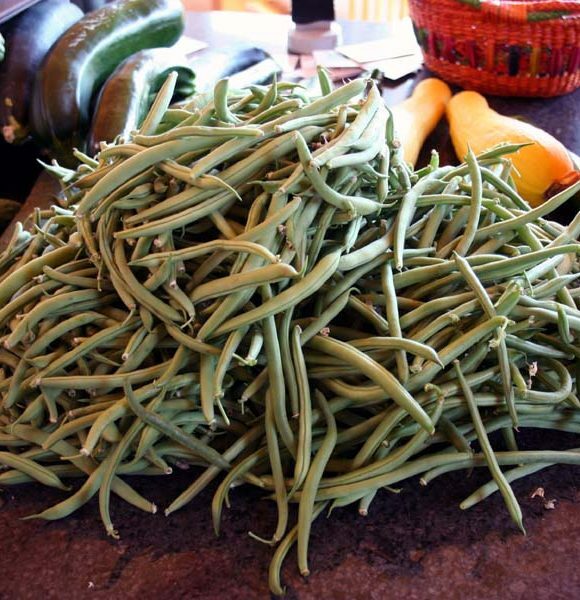 From the Garden 2012 – Save Me!